Don’t mar up your faucet using the wrong wrench! This Beer Faucet Wrench will easily get the job done. For the price, this faucet wrench is a no-brainer for anybody with a draft system. 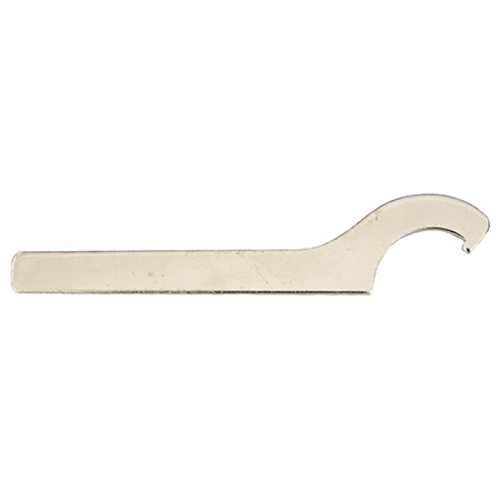 This faucet wrench is used for installing and removing a faucet from a shank for cleaning. We encourage everyone who buys a faucet to buy a draft tool. To facilitate faucet install for keezer build. Got to get the faucet on right? This was what I wanted at an acceptable price. It worked well and was easy to install my new taps on my Keezer! Easy tool to remove the collar on the spout. Simple enough, not extremely high quality, but quality enough to do the job. Kind of flimsy and hurts my hand. Honestly feel like this thing is only worth 50 cents. Nice little tool to have. Not much to it, but works great. Do not hesitate to order this one. This is the tool you need if you plan on converting a fridge to a kegerator. Makes taking apart my 5 taps a snap. If you have a keg set-up with a tower. You will need one of these! It works great and is quality. It won't bend or break. It's a fact, you need it. I've been using a hard wire, some pliers but I started ruining my lovely faucets. Buy one, it's not that expensive. Need one of these if ya have faucets! I have no problems with using this little guy works like a charm. Okay price to disassemble your facet, gets the job done. Does its job at a very reasonable price. Spanner wrench to disassemble facets. Also works on other applications needing such a wrench. Such as the 996T rear spoiler. I don't fully understand why faucets were designed this way but this wrench works well. I'd like it to have a more comfortable handle but for the price I'm not going to complain much.